According to the findings, 12% of single-family builders reported including solar photovoltaic panels in new home construction in 2013. More popular for single-family construction was geothermal groundsource heat exchange property, used for some projects by 26% of home builders. Wind power is less popular, with only 1% of single-family builders reporting its use. Multifamily developers were more likely to use these power production features in at least some of their projects. 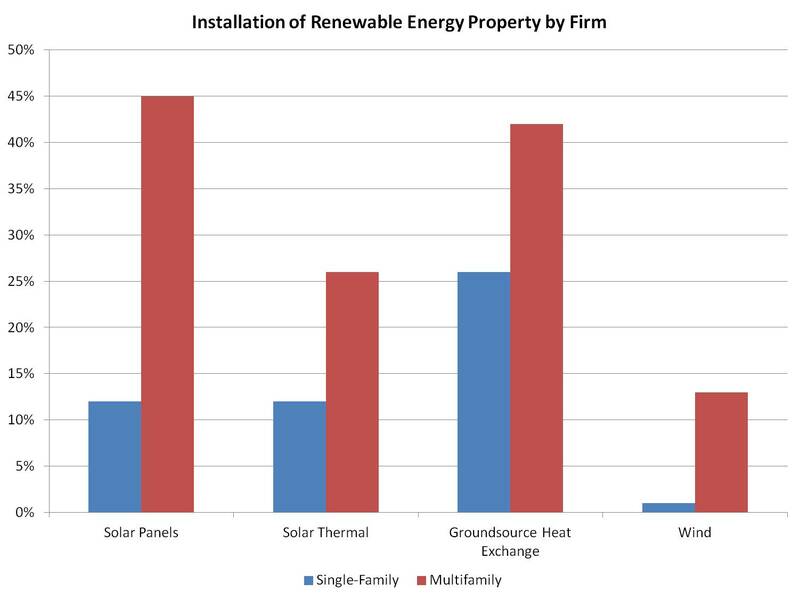 For example, 45% of multifamily developers used solar panels, 42% installed geothermal property in some projects and 13% reported using wind turbines. That said, the frequency of use of these items was more common on the single-family side of the market, perhaps due to incentives like the section 25D power production tax credit for new and existing homes. More than half of single-family builders who report installing solar panels do so on more than 25% of their projects. And more than 75% of single-family builders who install geothermal property do so on more than 25% of their homes. In contrast, for multifamily developers who report installing solar panels, more than 75% do so on fewer than 25% of their projects. And nearly all multifamily developers who report using geothermal do so on fewer than 25% of their properties.